Standardisation has evolved, trials confirmed 5G coul meet requirements announced. 3GPP first 5G release: System architecture milestone of 5G is achieved on time. 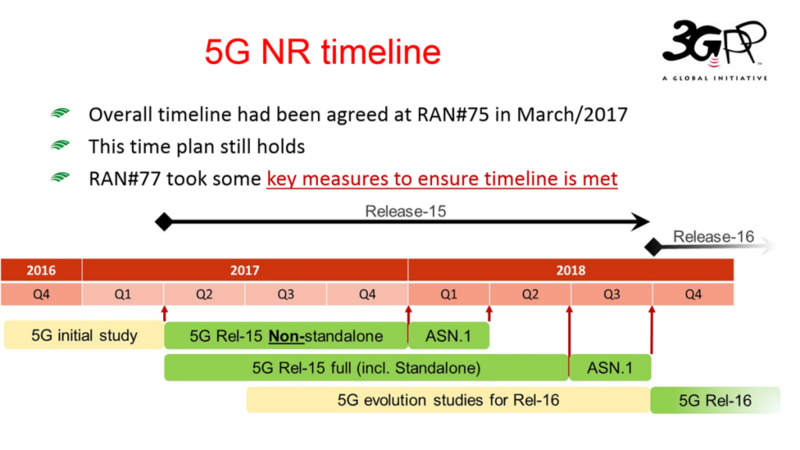 In March 2017, the industry agreed to a plan to accelerate up the 5G standardisation schedule and it was agreed to split up the specification of Release 15 (i.e. 5G) into two phases, Release 15 NSA (Non-standalone) as a priority and Release 15 Full (with standalone) scheduled for later in 2018. On December 21st, 2017, the 3GPP TSG RAN announced it successfully completed the first implementable 5G NR specification at its Plenary Meeting in Lisbon. AT&T, BT, China Mobile, China Telecom, China Unicom, Deutsche Telekom, Ericsson, Fujitsu, Huawei, Intel, KT Corporation, LG Electronics, LG Uplus, MediaTek Inc., NEC Corporation, Nokia, NTT DOCOMO, Orange, Qualcomm Technologies, Inc., Samsung Electronics, SK Telecom, Sony Mobile Communications Inc., Sprint, TIM, Telefonica, Telia Company, T-Mobile USA, Verizon, Vodafone, and ZTE have made a statement that the completion of the first 5G NR standard has set the stage for the global mobile industry to start full-scale development of 5G NR for large-scale trials and commercial deployments as early as in 2019. 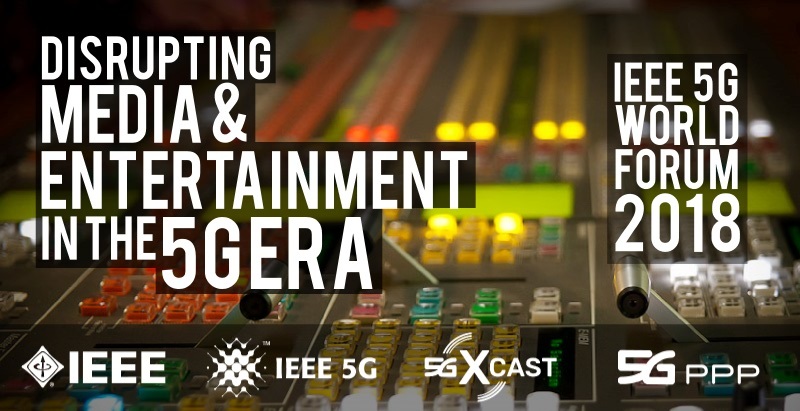 The 5G stage 2 level specifications include the overall architecture model and principles, eMBB data services, subscriber authentication and service usage authorization, application support in general, but also specifically for applications closer to the radio as with edge computing. Its support for IMS includes also emergency and regulatory services specifics. Further, the 5G system architecture model uniformly enables user services with different access systems, like fixed network access or WLAN, from the onset. The system architecture provides interworking with and migration from 4G, network capability exposure and numerous other functionalities. The complete description is provided by the delivered specifications TS 23.501, TS 23.502 and TS 23.503. After the stage 2 level specifications from an overall, architectural perspective, the work continues in all WGs (RAN, security, OAM and CT). Stage 3 level specifications are expected until June 2018. AT&T expects fixed 5G in 2018 and mobile 5G in few markets late in 2018. In 2017, AT&T also launched pre-standards 5G fixed wireless trials in Austin, Texas; Waco, Texas; Kalamazoo, Michigan and South Bend, Indiana with residential, small business, and education customers. AT&T plans to launch mobile 5G this year in 12 U.S. cities, and the carrier says the service will rely on small cells deployed closer to the ground than the tower top radios that support LTE. AT&T’s first round of mobile 5G will use millimeter wave spectrum. Outputs from trials in 11 markets showed better results than originally expected when it comes to propagation and range. The tests were using 28 GHz spectrum and 120+ nodes. Propagation of mmwaves is a little better in terms of LoS (Line of Sight) and elevation: signals could reach the 19th floor instead of the 6th as anticipated. Trials proved a better penetration through various wall materials (including low E glass) and could achieved to get signals into homes. Regarding density, trial results showed that in in dense urban areas, street coverage at 28 GHz in good on existing infrastructure. Mobile 5G “is not going to be a thing for Verizon in 2018”. But fixed wireless 5G is expected to be launched in 3 to 5 US cities by the end of 2018 (instead of 2019). On the other side of the Atlantic ocean, deployments are accelerating. 3.4-3.8 GHz spectrum will be auctioned in few countries in the next couple of years and will likely host first city trials. To this end, a number of cities have been selected for 5G trials. In France, the Ministry has just issued a public consultation on 5G, for a response by 15th February 2018, whereas the NRA, ARCEP, is boosting the development with 9 trials cities. To his end, temporary licences for 3.4 to 3.8 GHz are already available in the metropolitan areas of Lyon, Bordeaux, Nantes, Lille, Le Havre, Saint-Étienne, Douai, Montpellier and Grenoble. In Italy, 5 cities will launch pre-commercial trials of 5G networks, namely Milan, Prato, L’Aquila, Bari and Matera. 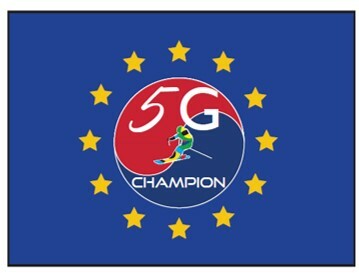 As a consequence, the government will make available spectrum in the 3.4 and 3.8 GHz bands for the 5G trials and auction it at the beginning of 2018.At the same time, the “5G for Italy” initiative was launched by TIM and Ericsson to speed up creation of a 5G ecosystem in Italy. The 5G for Italy programme focuses on implementation of pilot projects and applications in specific markets: security, transportation, manufacturing, automotive and health. TIM plans 5G launch for 2020 in the 700 MHz frequencies. Tests are scheduled to start in 2018 in Turin which was elected as the first 5G city in Italy. Other countries are expected to follow rapidly on the 3.4-3.8 GHz frequencies.